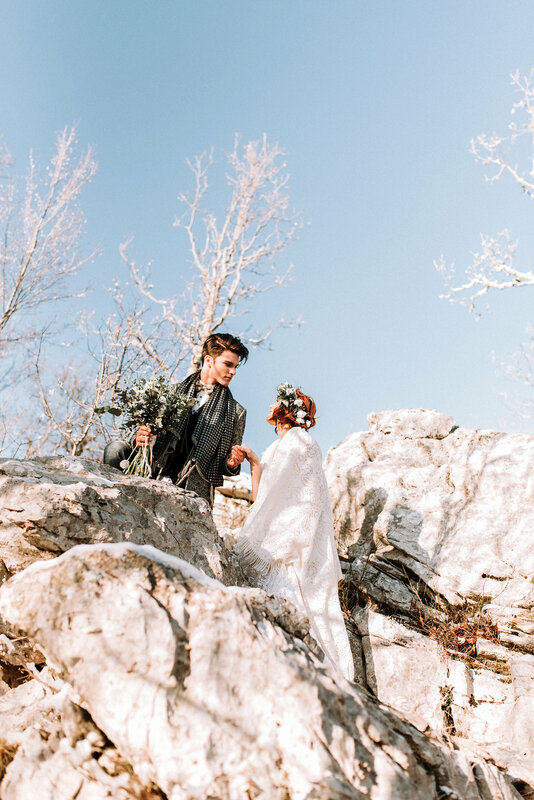 The thrill of sparkling slopes, the dazzling whiteness, the mad joy of childhood games and winter-tide textures fuse the most delicious romance, a clean sheet for a new life together in this hip, edge of the world wedding on the Papigo Alps. 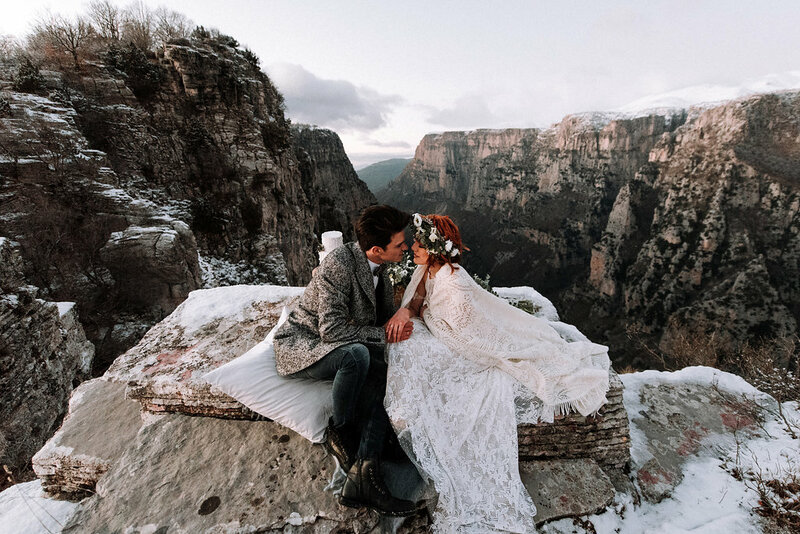 Perched on one of Greece’s most mysterious regions, with spine-tingling views off the edge of the inky Vikos Gorge, the pikes of Papigo are full of promises buried in the heart of winter. 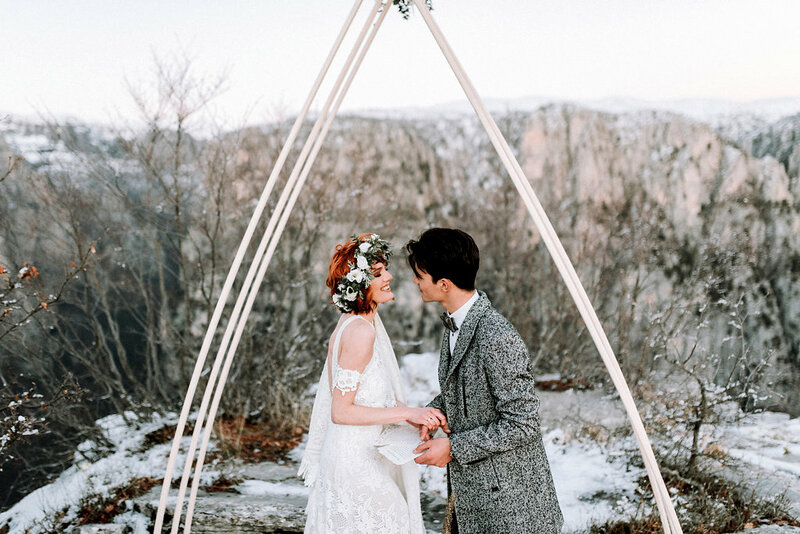 Instead of sliding slowly over gentle slopes, the sharp vistas and the crystalline air inspired us to design a wedding summit-bound fete, strewn with warm textures and sartorial elegance. 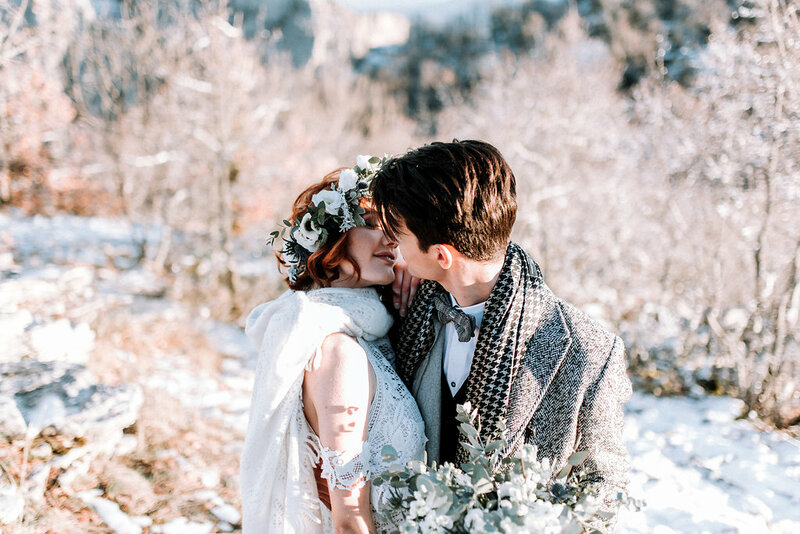 As snow silently enfolded the landscape in its white mantle so the charm of Amelia and Michael seeped softly into our consciousness. 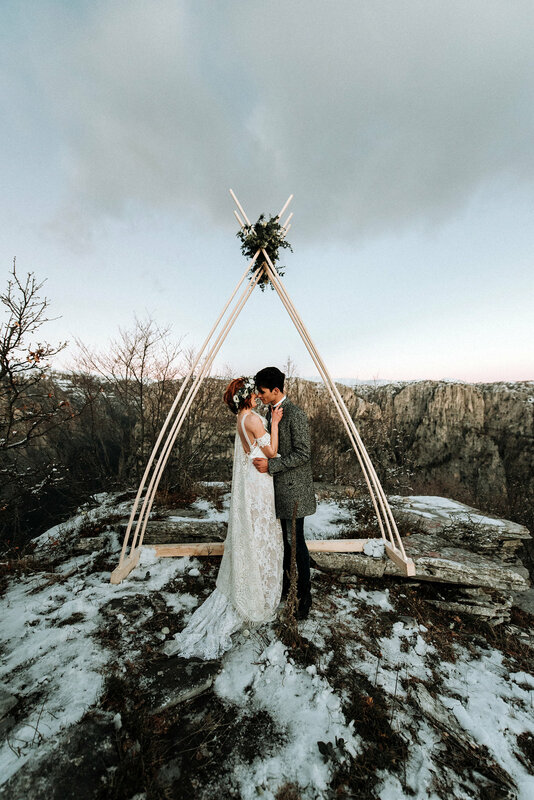 Their big day began at their stonebuilt lodge, where each was leisurely prepared. 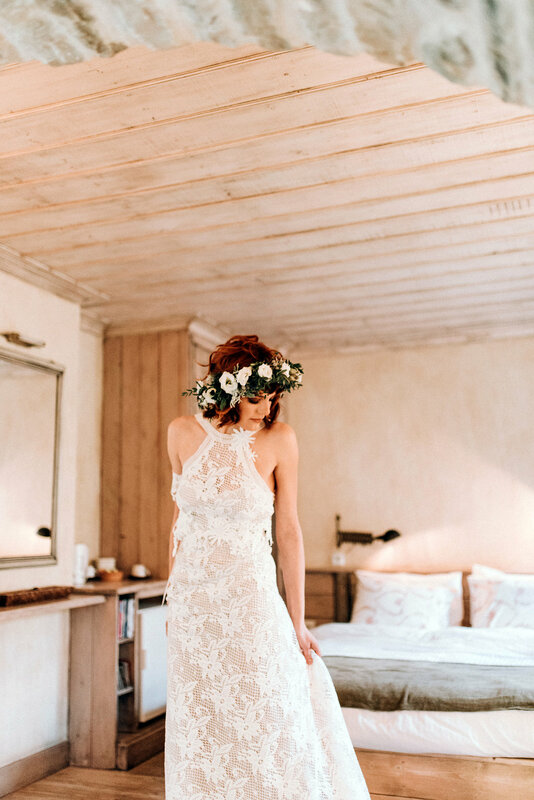 We love two sweethearts with a forward style, Amelia’s look embraces the romantic flower wreath and decadent lace, but her gown by Andreadis Creations and rustic cloak were matched to a pair of black jackboots. 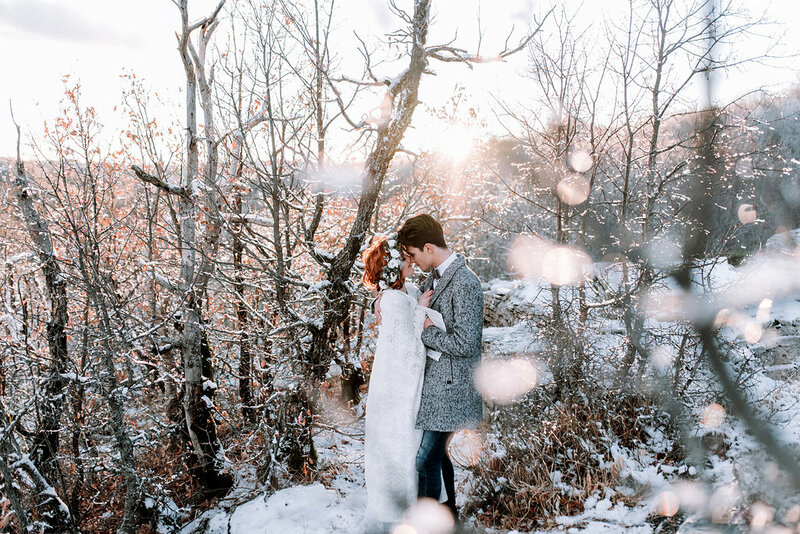 Michael’s herringbone coat was a perfect fit for his cashmere jacket, ripped jeans and whimsical bow tie. 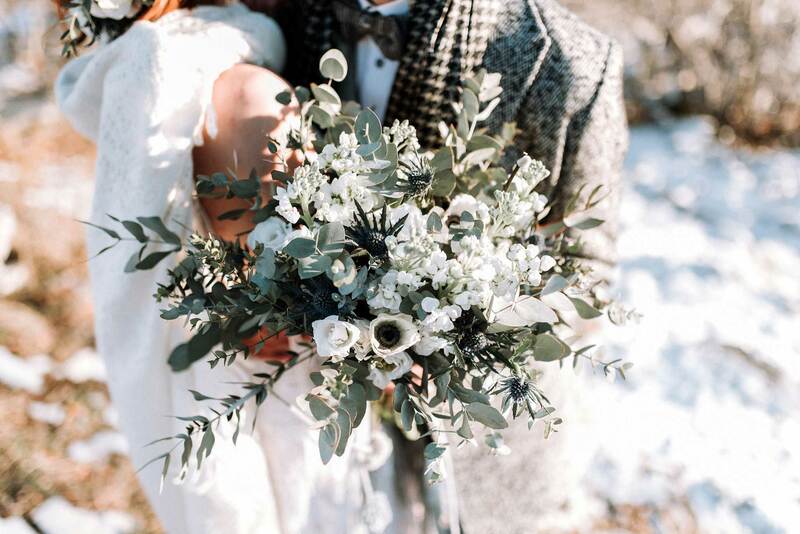 We wished for our couple to have a crisp ceremonial arch made up of wooden arbors, and minimal greenery additions, while we put the entire floral emphasis on Amelia’s wedding bouquet made up of Coton Salex Anemones, Eucalyptus Gunnii, Lysianthus, Eryngium, and Violets. 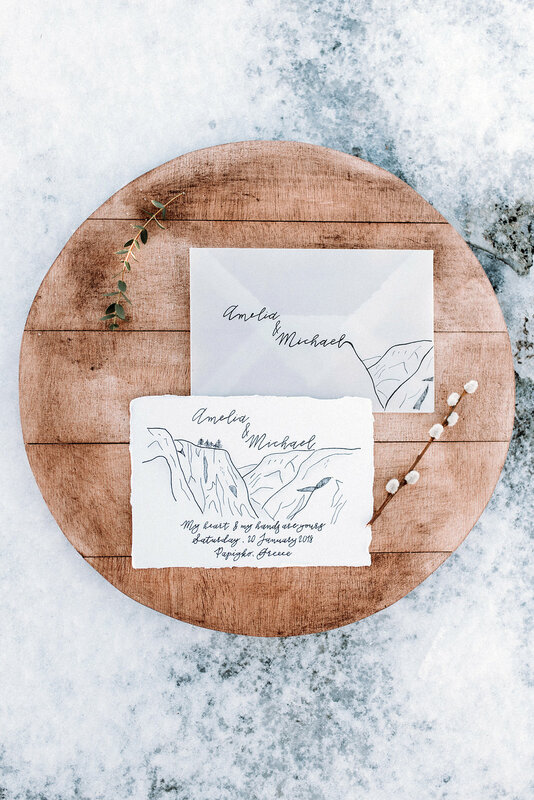 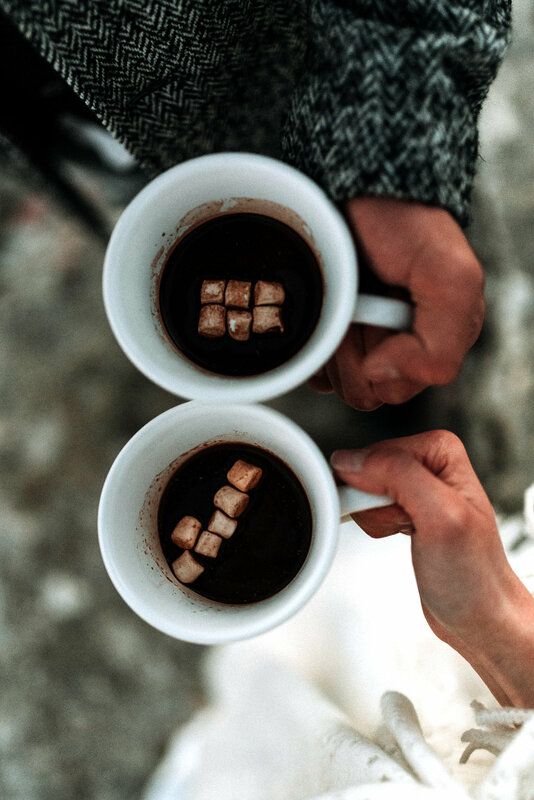 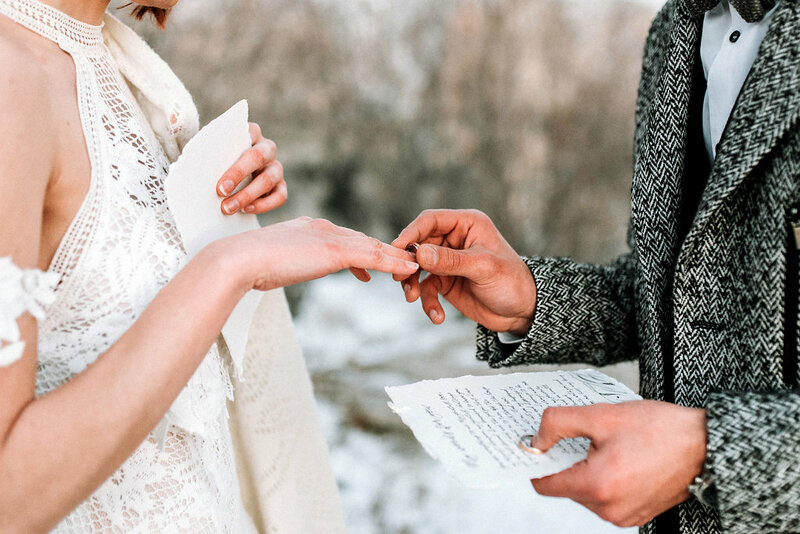 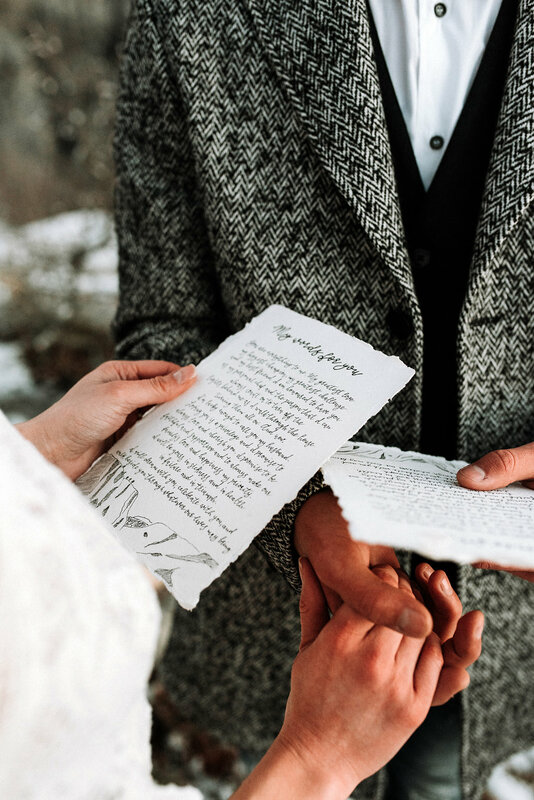 The beautiful couple exchanged their vows put in perfect calligraphy and graphic design by Manousenia had marshmallow cocoa from their customized cups and snuggled on the pelotage of a cashmere blanket, serving as their picnic felt. 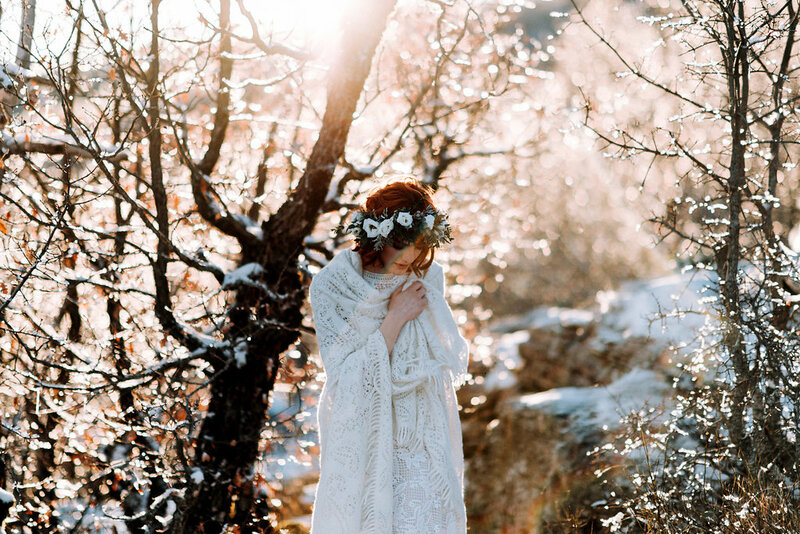 We employed cozy touches of worsted alpaca skeins and bulky handspun frills made of plush Targhee wool. 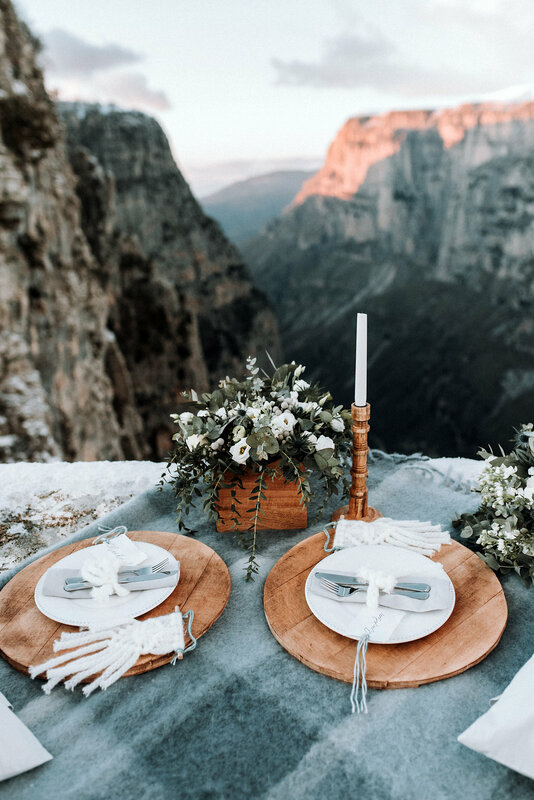 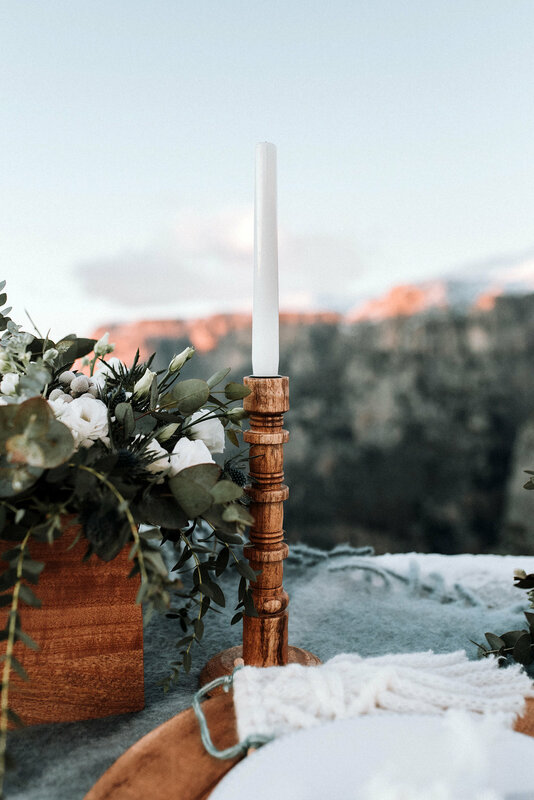 Wooden placemats, candlesticks, and vases added a warm softened flair to juxtapose our rugged backdrop. 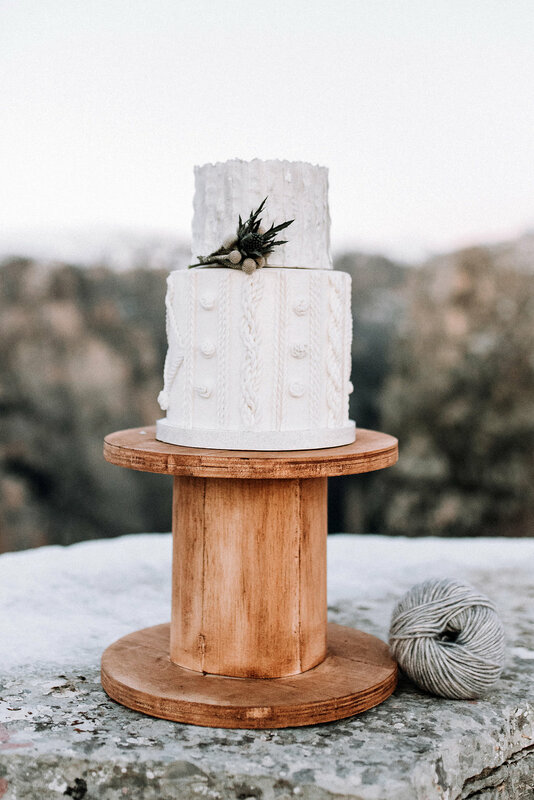 And of course we just had to have a chunky knit textured cake!!! 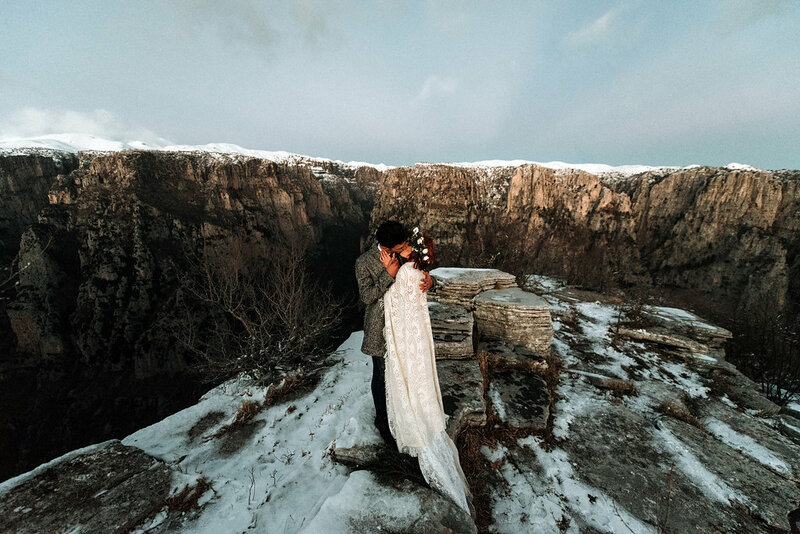 I loved working with Lefteris Kalampokas, his level of commitment to our shoot was astonishing, he captures with intent and truly poetic imagery. 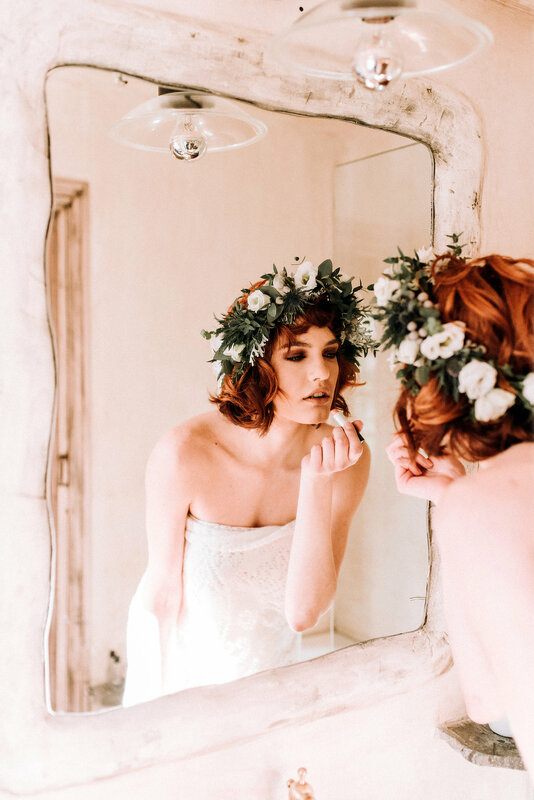 I couldn’t have done this without my beautiful crew and special artists who worked beyond their best abilities to create this shoot. 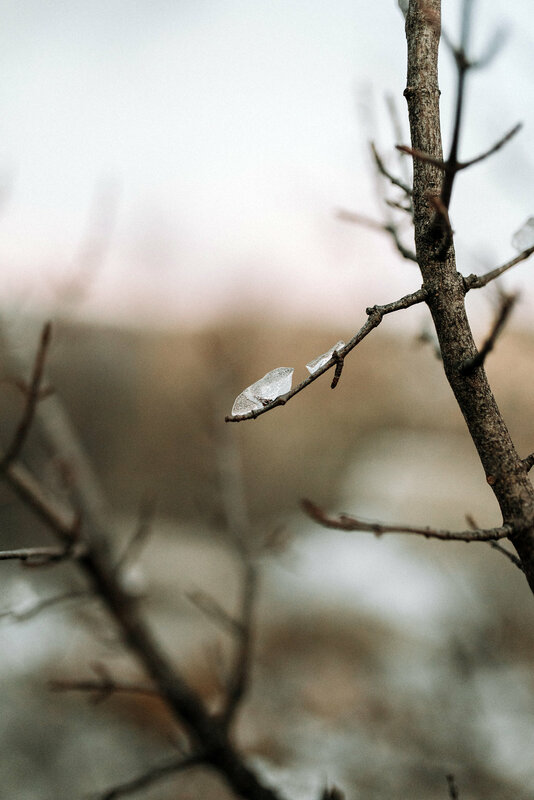 We all felt as if we were sitting at the edge of the world. 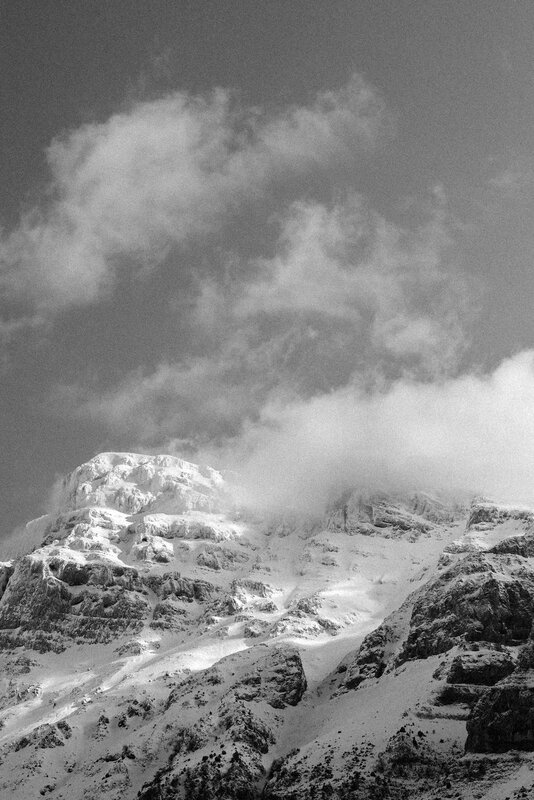 Plus we all got a superb chance to slide (not always with charisma) after we wrapped up our sesh, with one of the most stunning views ahead of us!